Working in West SoHo has its perks. With so many digital agencies planting roots out on Hudson and Varick, a lot of New York City food trucks have taken notice. Pretty much any day of the week, there will be four or five gourmet trucks serving lunch to the masses, each amazing in their own right. But there’s one I usually don’t see people waiting in long lines for or raving about online that I think deserves some attention, the Old Traditional Polish Cuisine truck. On this day, it was posted up right outside of my office on the corner of Varick and Charlton. The truck is not hard to spot. It’s the one with the fully-wrapped, rustic, faux-wood, Polish, thatched roof home design. I dig it, it always gets me in the mood for the homey Eastern European food they serve. 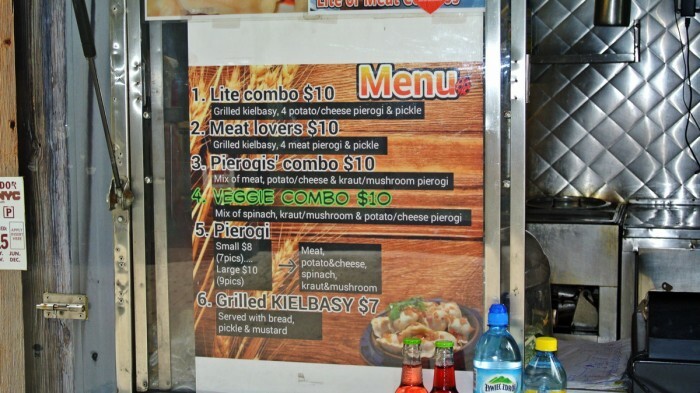 A quick look at the menu and you’ll find your options are pretty much limited to Polish sausage and pierogies along with a number of preset combos to make ordering easier. It may sound restrictive, but if this is the kind of food you’re in the mood for, I don’t know what else you’d want. I’ve always been more of a fan of potato filled pierogies than their meaty counterparts so I opted for the “Lite Combo” plate. I don’t know what kind of voodoo they’re pulling over in Poland, but in America no one would ever describe this platter as “lite”. And that’s also why I love it so much. For only $10 you get an absurdly enormous grilled kielbasa link, four plump grilled onion-topped potato & cheese pierogies, two pickle spears, a whole piece of rye bread, and big splotch of spicy brown mustard. Lite, yeah right. Anyway, the massive kielbasa link had a juicy, dense meaty interior and a super-snappy charred and scored skin on the outside. It had a really great smokey flavor that I particularly enjoyed, especially with a hearty swipe of brown mustard. The pierogies were the steamed variety and had a thick, noodley wrapper. They were generously filled with a creamy potato and cheese mixture and were bathing in glassy grilled onions and liquified butter. Simple, but very comforting. The snappy sour pickle spears were also excellent and served as a great flavor foil to the other items. They paired really well with the rich, hearty pierogies and smokey, meaty kielbasa link. 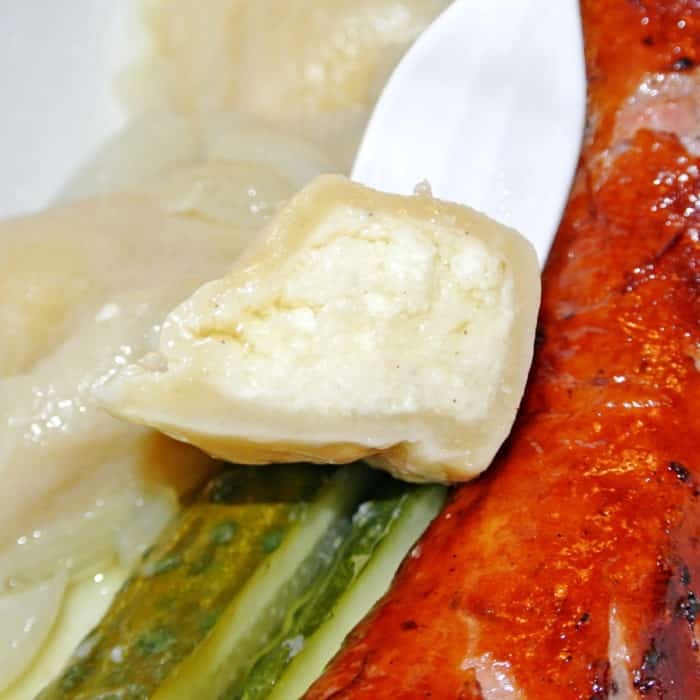 Though this hardly counts as eating light, the food at the Old Traditional Polish Cuisine Truck is definitely homey, comforting, cheap, filling, and delicious. Although they doesn’t get as much attention as some of the trendier trucks that park in the area, I always love stopping by and am truly glad they park near my office so frequently. 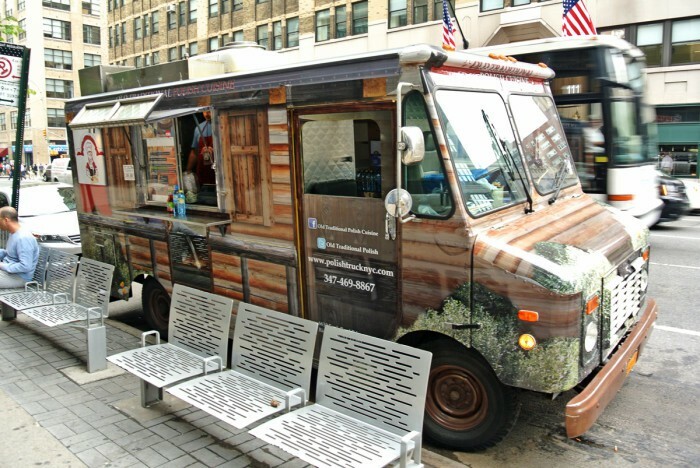 Got another great NYC food truck that doesn’t get the attention it deserves? Let me know in the comments below.